^ M.J.Whitley. Battleships of World War Two: An International Encyclopedia. Arms and Armour. 1998. ^ 2.0 2.1 H.P.Willmott. Battleship. Cassell Military. 2002. ^ 3.0 3.1 3.2 Steven J.Zaloga. Defense of Japan 1945. Osprey Publishing. 2010. ^ 4.0 4.1 Edwin P.Hoyt. Closing the Circle. 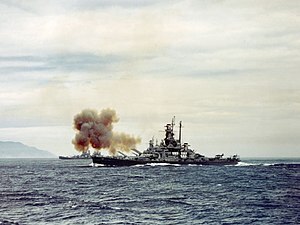 War in the Pacific: 1945. Van Nostrand Reinhold Company. 1982. ^ 5.00 5.01 5.02 5.03 5.04 5.05 5.06 5.07 5.08 5.09 5.10 5.11 5.12 5.13 5.14 5.15 5.16 5.17 5.18 Samuel Eliot Morison. Victory in the Pacific. 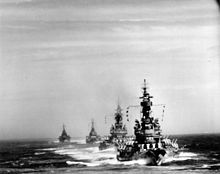 History of United States Naval Operations in World War II. Volume Fourteen. University of Illinois Press. 1960. ^ 6.00 6.01 6.02 6.03 6.04 6.05 6.06 6.07 6.08 6.09 6.10 6.11 6.12 6.13 6.14 6.15 6.16 6.17 6.18 6.19 6.20 6.21 6.22 6.23 6.24 6.25 Royal Navy. War with Japan. Volume VI Advance to Japan. HMSO. 1995. ^ 7.0 7.1 7.2 7.3 Tony Banham. We shall suffer there: Hong Kong's Defenders Imprisoned, 1942-45. Hong Kong University Press. 2009. ^ 8.0 8.1 （日文） 釜石市艦砲射撃. [2013-04-09]. （原始内容存档于2012-04-15）. ^ 9.0 9.1 E.B.Potter. Bull Halsey. Naval Institute Press. 1985. ^ Matthew Wright. Pacific War : New Zealand and Japan 1941-45. University of Illinois Press. 2003. ^ Peter C.Smith. Task Force 57. Crécy Books. 1994. ^ Richard B.Frank. Downfall. The End of the Imperial Japanese Empire. Penguin Books. 1999. ^ Economic Stabilization Agency. Overall Report of Damage Sustained by the Nation During the Pacific War. Japan Air Raids.org. 1949. （英文） Banham, Tony. We shall suffer there: Hong Kong's Defenders Imprisoned, 1942-45. Hong Kong: Hong Kong University Press. 2009. ISBN 962-209-960-2. （英文） Economic Stabilization Agency, Planning Department, Office of the Secretary General. Overall Report of Damage Sustained by the Nation During the Pacific War. Japan Air Raids.org. 1949 [2011年2月22日]. （英文） Frank, Richard B. Downfall. The End of the Imperial Japanese Empire. New York: Penguin Books. 1999. ISBN 978-0-14-100146-3. （英文） Hoyt, Edwin P. Closing the Circle. War in the Pacific: 1945. New York: Van Nostrand Reinhold Company. 1982. ISBN 0-442-24751-6. （英文） Morison, Samuel Eliot. Victory in the Pacific. History of United States Naval Operations in World War II. Volume Fourteen. Champaign, Illinois: University of Illinois Press. 1960. ISBN 0-252-07065-8. 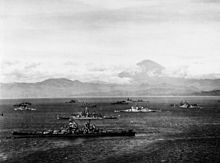 （英文） Roskill, Stephen W. The War At Sea 1939–1945. Volume III The Offensive. Part II 1st June 1944 – 14th August 1945. History of the Second World War. London: Her Majesty's Stationary Office. 1961. （英文） Potter, E.B. Bull Halsey. Annapolis: Naval Institute Press. 1985. ISBN 0-87021-146-3. （英文） Royal Navy. War with Japan. Volume VI Advance to Japan. London: HMSO. 1995. ISBN 0-11-772821-7. （英文） Smith, Peter C. Task Force 57. Manchester: Crécy Books. 1994. ISBN 0-947554-45-9. （英文） Whitley, M.J. Battleships of World War Two: An International Encyclopedia. London: Arms and Armour. 1998. ISBN 1-85409-386-X. （英文） Willmott, H.P. Battleship. London: Cassell Military. 2002. ISBN 0-304-35810-X. （英文） Wright, Matthew. Pacific War : New Zealand and Japan 1941-45. Auckland: Reed. 2003. ISBN 0790009080. （英文） Zaloga, Steven J. Defense of Japan 1945. Fortress. Oxford: Osprey Publishing. 2010. ISBN 1-84603-687-9. United States Strategic Bombing Survey Naval Analysis Division. Report of Ships Bombardment Survey Party–Foreword, Introduction, Conclusions, and General Summary. 1946.